We've been treated to some awesome new music this week, with Mötley Crüe madman Tommy Lee, Black Label Society newboy Will Hunt and ex Placebo drummer Steve Hewitt all releasing new tracks. In case you missed them, check out our handy round-up of the week's best new music. 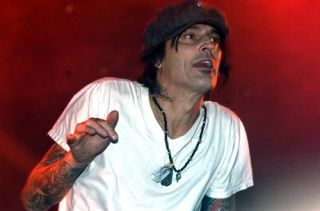 Tommy Lee has taken his Mötley Crüe hat off and dived well and truly headfirst into Methods of Mayhem. Having toiled on the project (which involved inviting demo submissions from fans through his website) for most of the year so far, the fruits of his labour are now beginning to come to the fore. You can download the first track made available from his forthcoming album here. It took us right back to the late 90's nu-metal explosion, and we're pleased to say Tommy has toned down the rapping a little since the first Methods record. Six string behemoth Zakk Wylde and his Black Label Society boys have crawled out of the Black Label Bunker armed with a ball-busting set of tunes on the strength of 'Parade Of The Dead' - the first cut released from new album Order Of The Black. The track is an absolute beast, featuring some suitably heavy playing from new drummer Will Hunt. Check it out below. Tommy Lee isn't the only drumming capable of penning a decent tune, you know. Former Placebo sticksman Steve Hewitt proves just that with new band Love Amongst Ruin. Steve has stepped out from behind the kit and is fronting the band, and we must say he's sounding pretty damn good.